Geotagging photos sounds good, but it can become a laborious process to mark the source of every photo in your photo library. Now the Eye-Fi Geo will bring automatic geotagging to every photo you take. 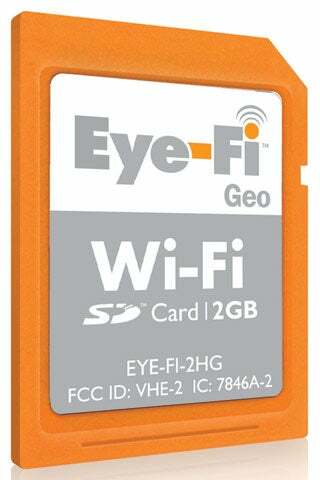 Essentially an SD card with GPS Wi-Fi triangulation, the 2GB Eye-Fi Geo (like Eye-Fis of yore) fits into any SD card slot. It records location information along with your pictures through integrated GPS. Then it can sync over Wi-Fi to your home computer or internet sites of choice. Fully iLife '08 and '09 compliant, the Geo may sound a lot like the Eye-Fi Home. It's essentially the same thing, but you get unlimited geotagging on top of home syncing. MOUNTAIN VIEW, Calif., July 29, 2009 - Eye-Fi Inc. today unveiled the Eye-Fi Geo card, a new wireless SD memory card exclusive to Apple that allows users to automatically upload photos from a digital camera to a computer and offers lifetime geotagging service. Available today in all Apple stores and online, the Eye-Fi Geo card is the latest addition to the Eye-Fi product family that is built to seamlessly integrate with Mac products and applications, including iPhoto '09 and '08, the iPhone and MobileMe. "Apple users want simplicity and an effortless user experience, so it's not surprising that a significant number of our users are on Macs," said Jef Holove, CEO of Eye-Fi. "The Eye-Fi Geo is the perfect companion for iPhoto's new ‘Places' application to pinpoint photos on a digital map so memories are displayed in a richer, more meaningful way." The Eye-Fi Geo wirelessly uploads photos straight to a folder on your computer or Apple's iPhoto gallery where they arrive automatically geotagged with location information about where the image was captured. Eye-Fi continues to embrace its loyal Mac following by developing products that seamlessly integrate with Apple products and features. iPhoto '09's "Places" lets users search and sort photos by location using geotags from the Eye-Fi Geo card. Users can also upgrade their Eye-Fi Geo card to share images online at MobileMe or one of more than 20 other photo sharing and social networking sites for a $9.99 annual fee. Earlier this year, Eye-Fi released the Eye-Fi application for the iPhone, which wirelessly uploads photos from the iPhone to the Web and into iPhoto, or organized folders on a computer. With Eye-Fi, users can aggregate all of their photos – from both an iPhone and a digital camera –to manage and share photos in one place regardless of which device the photos are taken on. Eye-Fi users with iPhones can download the app for free. Eye-Fi's complete line-up of wireless SD and SDHC memory cards, including the Eye-Fi Pro and Eye-Fi Explore Video cards, range in price from $49-$149 and are available at www.eye.fi, in store at Apple Retail Stores and Best Buy locations, and at major online retailers such as Amazon.com, Walmart.com and Costco.com. Eye-Fi cards have won numerous Mac product awards, including "Best of Show" at Macworld 2008 and The Mac Observer's "Editors' Choice Award 2008" at Macworld. For more information, please visit www.eye.fi/apple, or follow Eye-Fi on Twitter @EyeFiCard. Founded in 2005, Eye-Fi is dedicated to building products and services that help consumers navigate, nurture and share their visual memories. Eye-Fi's patent-pending technology works with Wi-Fi networks to automatically send photos and videos from a digital camera to online, in-home and retail destinations. Headquartered in Mountain View, Calif., the company's investors include LMS Capital, Opus Capital, Shasta Ventures and TransLink Capital. More information is available at www.eye.fi.